I wanna put up an amazing nautical look, your blog inspires me! You have to get that shirt! Love the necklace. There are also similar ones like that one on etsy. SO Cute!! too bad the t-shirt isnt online it would be perfect!! 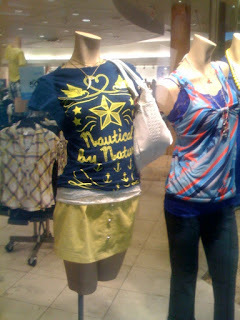 I can't believe the tee shirt says, "Nautical by Nature." It was made for you! You NEED to get that shirt ASAP. Also, the anchor necklace in the Shopaholic movie is adorable! You'll love it! Target has tonnnsss of Anchor jewerly right now...might want to check it out! It's paired with pretty bright colors though instead of the usual red-blue-etc.-theme. Don't you just LOVE that store? My friend got the CUTEST shoes ever from there recently but she lives all the way in Washington so they sell different things there then they do online so I couldn't get them. Very disappointing. Love the finds! Now, you need that shirt. I get totally LOST while watching LOST but I'm the same way...just go with the flow. I still get really angry when the episode is over though!!! You have to find that shirt!!! Too adorable!!! Cute stuff!! I definitely recommend FSU, especially when it comes to their criminology program. My Mom actually graduated from FSU with a degree in criminology and became very well know in her field. Have you been able to visit campus and all? That shirt is all you! You have got to get it. That necklace is a steal for $6! oh i love that red and white top!! Ok maybe I need to make a trip to the store for that shirt! Please tell me you are purchasing that top!? It has your "name" on it for goodness sake! And it's cute too! I totally thought of you yesterday when Miss Priss and I saw Confessions of a Shop-a-holic and Isla has on the super-great anchor necklace! Love your blog! 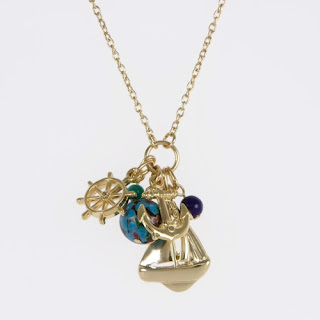 Cute necklace in this post, anchors are the perfect accessory, especially in the summer! http://www.tomtomtomtom.com/main.htm <----- this jewelry is right up your alley!! 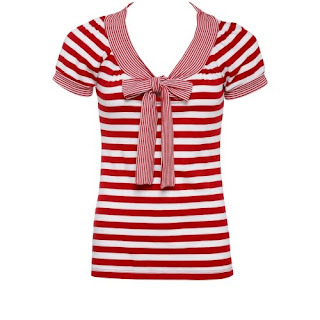 and that first red and white top is darling. Actually I saw this the other day and thought of your site! I am going to see it today!! Oh Miss Nautical, these are all great! For some reason the necklace is appealing, I don't know why! I adore the first one! You have to get that shirt! That's awesome!! ahh the necklace is ubercute! i can't believe its such a steal. and you have to get that tee! i love your blog! Fabulous finds.!! That shirt is really cute and that necklace is amazing. I would like to buy that shirt on my next Charlotte Russe trip.